From Ajaccio to Longwood, Napoleon's destiny was marked by islands. Set sail with us to the place where it all began, Corsica, Napoleon's native land, where the legend was born. Such were the young Napoloen Bonaparte’s words, and they appear to sum up the child’s personality during his formative years spent on French territory. A loner and undisciplined in his work, Napoleon was to become passionately interested in his native land, almost hero-worshipping Pascal Paoli, the embodiement of Corsican resistance. Indeed even on St Helena, the dethroned Emperor’s thoughts still turned to his early years. And if childhood is the keystone of a person’s identity, Napoleon’s is even more interesting in that it takes us to the origins of a legend. This itinerary follows the traces of the Bonaparte family in Corsica. It will take us deep into the early childhood of Napoleon in Ajaccio and give a portrayal of the cult figure of Paoli. In doing so it will help us understand the young man’s political commitment in favour of Corsican independence and his later siding with France. Different routes around Ajaccio and Corte are suggested as well as ‘Escapades’ to Bastia, Calvi and Bonifacio. When the place visited has a hypertext link, the link takes you to a detailed file in the Guide. Two interactive maps are available above: one shows Corsica and places of Napoleonic interest on the island, the other is a detailed map of the centre of Ajaccio. They will help you to follow this itinerary more easily, as will all the other practical information. In the heart of the island, half way between Ajaccio and Bastia stands Corte, raised slightly above the floor of the valley by its position on a hill. On the eastern slope, the quarters of the old town rise in steps up to the ramparts of the Citadel which, perched on a rock outcrop, towers over the confluence of three rivers, the Tavignano, the Restonica and the Orta. Being the only inland military stronghold in Corsica, Corte established itself as the strategic crossroads, controlling all of the inland areas of the island. And such a position led to its being fought over in the many power struggles which tore the island apart over the centuries. As often as it could, Corte beat off the Genoese invader and became the centre of the war of independance, a war which led to Corsica becoming the first state ever to have a democratic constitution. Starting in 1729, four rebellions shook the island, and despite the intervention of Austria, a consulta (assembly) meeting in Corte in 1735 proclaimed national independance. Genoa, with military support from France, reaffirmed its authority and another revolt occurred on the departure of the French troops. The consulta of Orezzo in August 1745 nominated new heads, Ignazio Venturini, Alerio Matra and Gian Pietro Gaffori. The latter extended his influence and in 1751 established a strong government. Feeling threatened by his influence, Genoa had Gaffori assassinated. It was then that Pascal Paoli appeared on the scene in the island’s history. Nominated general of the Corsican nation by the consulta of Sant’Antonio de la Casabianca on 15 July 1755, this twenty-nine year old made it his aim to crush resistance and establish the political unity of the nation and to raise moral. He set up the seat government in Corte, and from 1755-1769 Corte was the capital of independant Corsica. He had a constitution ratified which affirmed the sovreignty of the nation, he decreed the separation of the powers of church and state, minted coins, reorganised the courts, raised a small army, attempted to revitalise an economy ruined by 25 years of war, opened public schools in all the villages, founded the university of Corte and started a newpaper. But the Genoese still held the principal ports on the island. Paoli thus built a small fleet and founded the port Ile Rousse. But when by virtue of the Treaty of Compiègne and then the Treaty of Versailles of 1768, Corsica was ceded to France, Paoli found himself fighting against one of the strongest powers of Europe. The subsequent fight was very one-sided and with defeat at the Battle of Ponte Nuovo on 8 May 1769, Paoli fled to England. The visit to Corte begins at the end of Cours Paoli in Place du Duc de Padoue. Here stands a statue of Jean Thomas Arrighi de Casanova (Corte 1778 – Paris 1853), present at all of the battles of the Consulate and the Empire, as the inscription on the pedestal records: Salhieh, Jaffa, Saint-Jean d’Acre, Marengo, Wertingen, Friedland, Leipzig and Fère Champ. Raised to Duke of Padua in 1808, Arrighi was exiled from Italy after Waterloo and ended up Senator for Corsica during the Second Empire. Indeed, this bronze statue (the work of Auguste Bartholdi, 1867) was designed and erected during that period. Going back up the Cours Paoli to the Place Paoli the visitor enters the heart of the old town. A statue of the ‘Father of the Homeland’, made in 1901 by Alembert, marks the centre of the town. Here there is an itinerary marked with numbered arrows which takes the visitor to all of the interesting monuments in Corte. And the old town makes for a delightful wander; the narrow streets and rudimentary buildings often on very steep inclines very much give the town the feel of a village. The small Rue Scoliscia has a stepped rise up to Place Gaffori where a statue of this hero of Corte stands with its back to the house where he was born. Bullet marks can still be seen on the façade, providing eloquent witness to the violence of the wars of Corsican independance. The story runs that Faustina, Gaffori’s wife, threatened to set light to a barrle of gun powder to prevent the partisans from surrendering to the enemy in 1750, and in 1752 Gaffori is said to have replied to the enemy who held his son hostage “I am a patriot first, and a father second”! Fortunately both the child and the citadel of Corte were saved. Just above this Place is the Place Poilu where Napoleon’s parents once lived. After having been sent by his uncle Lucien to study law at the university of Corte, Joseph Bonaparte was introduced to General Paoli who welcomed the young man from Ajaccio warmly. As a result Joseph joined the struggle for the defence of the Corsican nation. After the marriage of Charles Bonaparte to Letizia Ramolino, the young couple moved to Corte and their first son was born there. And on the house in which Joseph was born, number 1 Place Poilu, there is a commemorative plaque bearing the inscription: ‘In this house were born Joseph Napoleon Bonaparte, King of Naple and Spain,on 7 January 1768, who died in Forence on 28 July 1844, and Jean Thomas Arrighi de Casanova, Duke of Padua, Division general and governor of the Invalides on 8 March 1778, who died in Paris on 22 March 1853′. To the left of this Place stands the Palais national, the administrative building inhabited by the representatives of Genoa and where Paoli set up his government of the independant Corsica. The ground floor of the building was for a long time used as a prison, and this function was to last in part until the end of the 19th century. With the re-establishment and inauguration of a new university in Corte in 1981, the Palais National became a Centre for Corsican studies and now houses that institution’s library. On climbing to the left the steps which follow the walls of the citadel, you reach a viewing point with a magnificent view of Corte and its environs. The rocky outcrop of the citadel can clearly be seen, as can the Eagle’s Nest built in 1419 by the viceroy of Corsica, Vincentello d’Istria, on behalf of the king of Aragon. The ensemble of the citadel was rebuilt under Louis XV and again under Louis XVI. Under Louis-Philippe the houses within the walls were demolished and the military buildings were used as the garrison for the town before being converted into a main prison for political detainees. From 1962 to 1983 the Foreign Legion occupied the site. Today the citadel houses the Musée de la Corse and the Fonds Régional d’Art Contemporain. The Musée de la Corse is a museum of anthropology opened in 1997 largely to exhibit the objects collected by Father Louis Doazan between 1951 and 1978 in Ajaccio, Castagniccia, Violais, Niolo and Filosoma. The visitor is taken on a fascinating journey through the history of Corsican traditions where local techniques, know-how and craftsmanship are perfectly illustrated by the exhibits. Mention is made of the Merimée’s visit in 1839 and also the excursion made by Prince Roland Bonaparte, president of the Société française d’anthropologie and member of the Société des Traditions populaires. On the prince’s request a collection of artefacts and eye-witness accounts was made and the results were published. The second floor of the museum takes as its subject industrial development in Corsica in the second half of the 19th century, the refounding of the Confraternities and the expansion of tourism. A space for temporary exhibitions, a record library, an image library and an educational visitors’ centre complete this excellent museum. On leaving Corte, take the N193 in the direction of Ponte Leccia and follow the road as far as Ponte Nuovo. It was here on 8 May 1769 that Paoli’s troops were defeated by the French. The ruins of the Genoese bridge which was at the centre of the battle can still be seen – the bridge itself was destroyed during the Second World War. Nearby can be seen small monument with a cross on top bearing the following inscription in Corsican: ‘Qui casconu u 5 maghu 1769 e milizie di Pasquale de Paoli luttendu per aliberta di a patria’ (Here on 5 May 1769 fell the armies of Pascal Paoli fighting for the liberty of the homeland). Charles Bonaparte took part in the armed campaigns of 1768 and 1769 against the French. After the defeat of Ponte Nuovo, he was forced (along with his wife Letizia – then six months pregnant with Napoleon!) to take to the mountains with other Paolist supporters. This tragic episode just before Napoleon’s birth was to have a strong influence on the young Bonaparte’s political activity: “I was born when the homeland was dying. Thirty thousand French soldiers were regurgitated onto our shores, drowning the throne of liberty in a sea of blood. Such was the odious spectacle which greeted my eyes as they opened for the first time. The cries of the dying, the groans of the oppressed, the tears of those in despair surrounded my cradle right from my birth”. These were the words which Napoleon wrote to Paoli, his childhood hero, in a letter dated 12 June 1789. He subsequently added: “When you left our island with you went all hope of happiness, slavery was the price of our submission”. But despite his parents rallying to the French cause shortly after Ponte Nuovo and the exile of the ‘Babbu di a patria’ (Father of the homeland), during his chilhood and adolescence Napoleon had developed a bitter hatred of the French invader. However, gradually his feelings changed. For three years Bonaparte was torn between his passion for Corsican independence and his recognition of the fact that to succeed the island could not avoid being attached to France. After distancing himself from his spiritual leader, whom Napoleon considered had abandoned the ideas of the revolution, Napoleon set himself against Paoli and joined the Convention. The split between Paoli and Napoleon was final when Paoli was declared ‘traitor to the Republic’ and was removed from his post of command following accusations by Lucien Bonaparte in 1792. On fleeing the island in 1793, Napoleon forgot his dreams for Corsica to play out his destiny on another, larger stage. Set next to the Col du Prato right in the centre of Castagniccia, the village of Morosaglia brings us to the symbol of Corsican independance, Pascal Paoli. Eldest son of Hyacinthe Paoli, a leader of the second of the four uprisings in the Corsican revolution, Paoli was born on 6 April 1725 in the hamlet of Stretta in the comune of Morosaglia. Following his father into exile in Naples, he acquired a good classical education whilst at the same time familiarising himself with the ideas of French philosophers. Taken on by the Neapolitan army, he was stationed on Elba in 1854 and subsequently was the leader of independent Corsica from 1755 to 1769. After Ponte Nuovo, Paoli spent 21 years of exile in England before returning to the island in triumph in 1790. He had achieved almost mythical status and was well-known and highly acclaimed by the ‘age of enlightenment’. But his dreams of an independent Corsica foundered on the division between differing political factions. Against France, Paoli called on the support of England and this led to the founding of Anglo-Corsican kingdom on 15 June 1794. But the troubles which split the island forced him once again into exile. He died in London on 5 February 1807 and was buried in St Pancras cemetery. His remains were brought from England to Corsica on 3 September 1889 to rest in a chapel created on the ground floor of the house where he was born in Morosaglia. After Ponte Nuovo, take the D71 to Morosaglia. At the sign marking the village, take the path on the left which leads to an old traditional Corsican house of the type common in the Castagnaccia region, itself so beautiful in the autumn when the forests of chestnut trees turn gold. A statue of Paoli stands at the entrance to the village and a museum has been installed in the house where Paoli was born. In it, various documents, engravings and paintings recount the life of this extraordinary man. His relations with Bonaparte are referred to several times. Whilst their first meeting in 1790 is marked by Paoli’s respect for Napoleon – “You are like an antique hero, like a man out of Plutarch” were his words – nevertheless their opinion of each other later deteriorated. Soon they reacted to each other not only with defiance but also with annoyance – when Bonaparte asked for some documents which he needed to write a history of Corsica which he had begin to write, Paoli snapped back “History cannot be written by young men”. Later on, in exile, Paoli finally expressed his admiration for Napoleon: “Liberty was the aim of our revolutions: it is only to be enjoyed on the island of Corsica. What does it matter who brought it about? For our part, we have the pleasure of having received our liberty from a compatriot, from someone who with all glory and honour avenged our homeland for the many outrages perpetrated upon it by almost every nation. Today, the name of Corsica is no longer despised”. This fourth route takes the visitor out of Ajaccio to other sites and buildings linked to the history of the Bonaparte family and Napoleon’s childhood. The first of these sites is on the Route des Sanguinaires on leaving the town to the west. This coastal route which leads to the La Parata point was built in the 19th century when tourism was just beginning to develop. The road itself passes several small beaches shaded with palm trees, which the proliferation of modern buildings around completely ruins. On the seaward side stands the Chapelle des Grecs, a church built in the 17th century and dedicated to Santa Maria del Carmine. Between 1731 and 1774 it was used by some Greek families who had been driven out by Corsicans from the Cargèse region where they had been sent by the Genoese in 1610. Several member of the Pozzo di Borgo family were buried here, as was Pascal Fiorella, Brigadier General who passed over to the serve the Italian republic and he became a senator of the Kingdom of Italy in 1809. The young Napoleon often passed this chapel on his walks with his elder brother. A commemorative plaque on the wall gives a quotation from the memoirs of Joseph Bonaparte: ‘Our daily walks with Napoleon went beyond the Chapelle des Grecs along a coast as beautiful as that beside the Gulf of Naples, in countryside heavy with the scent of myrtles and orange trees. Sometimes we did not return until nightfall’. On occasions they went as far as the La Parata point, about 14 km west of Ajaccio onto a promontory previously called ‘La Chasse de Génois’. From the Tour de la Parata, built in 1608 to defend the coast from Moorish pirates, the view of the gulf and the ‘Iles sanguinaires’ (the ‘blood-red islands’, known as such from the red colour which they take on at sunset) is absolutely spectacular. Return to Ajaccio and take the D61 in the direction of ‘Alata’. At the first junction in the road, a slip road to the left leads to the Bonapartes’ villa, ‘Les Milelli’. This old house in its enchanting setting towers over the Gulf of Ajaccio. As the family’s retreat from the great heat of high summer, Les Millelli with its olive groves was one of the principal sources income for the Bonaparte family. They also owned other properties, notably: La Sposata and La Casseta for their vines, Les Salines where mulberries were grown, as well as their land in Ucciani, Bastelica and Bocognano. Despite the many legends recounting their poverty, the Bonapartes in fact lived quite well for the Corsica of the period. They were wealthy but not ostentatious and with no pretentions to luxury and superfluity. On Saint Helena, Napoleon gave a detailed description of the family’s sources of income, largely based in this rural milieu on harvest and barter. “In my family, the principal was never to spend. We only used money for the things which were absolutely essential, things like clothes and furniture,etc. We never bought anything for the table, apart from the thins which did not grow in Corsica – coffee, sugar, rice, etc. Everything else was supplied by the land. The family had a simple mill where all the villagers would come to have their corn milled and they would pay with a little cornflour. The family had a simple oven which people would pay for with fish. We harvested wine and people would pay for it with milk and goat’s cheese. We didn’t even pay for our meat. We had an arrangement with the butcher – in exchange for his butchered meat we would supply him with an equivalent amount of sheep, lambs, goats and even cows. The important thing was not to spend any money. Money was very rare. It was quite a thing to pay only with cash. In Ajaccio there were only two olive groves, one belonged to the Bonapartes and the other belonged to the Jesuits. Many others have sprung up since. Our custom was that when the harvest came close relatives – uncles, aunts, first cousins, grandparents – would come for the oil they needed. On the Sunday, the day when the locals came with their goats, their cheese, their milk etc., there was a big celebration which lasted until the next day, and in winter even to the day after. In summer, the perishables were given as gifts to relatives – we could never have bought presents, that would have been seen as not right. The family also harvested wine. It was a point of honour for the family that they never bought bread, wine or oil” (Cahiers de Sainte-Hélène, 15 February 1821). Les Milelli was for Napoleon the ideal place of retreat. On every one of his returns to Corsica, he came to see the house and here in 1799 on his return from Egypt he spent 2 and 3 October in the company of Murat, Lannes and Rear-Admiral Gantheaume. Two days later Napoleon left Corsica never to return. In the 1970s and 80s, Les Milelli housed the ethnographic collection belonging to Louis Dozan, today exhibited in the Musée de la Corse in Corte. Since then the house has been closed to visitors and left empty, but the beauty of the countryside makes it the place perfect for historical reverie. Continuing along the road to Alata, at about 10 kilometres from Ajaccio, there is another building in an idyllic setting which is well worth the visit: the Château de la Punta, whose extraordinary history makes it of great interest to art and history enthusiasts alike. The Château de la Punta was built from the ruins of the Palais des Tuileries, burnt down in May 1871 during the Commune period. Of the Tuileries Palace commissioned by Catherine de Médicis from Philibert de L’Orme in 1564 all that remained was the external walls which the French House of Députés, in 1882, decided to demolish, against the wishes of Baron Haussmann, the Député for Corsica and supporter of the plan for the restoration of the house. It was then the Jérôme Pozzo di Borgo and his son Charles – the descendants of Napoleon I’s enemy, Charles-André – offered to buy a majority of the stonework in order to build a château on their ancestral lands in Alata. This was to fulfil the wishes of their great-uncle who desired that a house worthy of the standing of the Pozzo di Borgo family should be built on this land which he had bequeathed to them. This extraordinary enterprise began in 1891 with the transportation of the stones – which themselves had witnesses the passing of so many kings and emperors – by train to Marseilles and then by boat to Ajaccio. The architect Vincent designed an edifice which took as its inspiration the west façade of the Bullant Pavilion, using on the south façade Ionic columns on the ground floor and Corinthian columns on the first. All the other façades were decorated with elements re-used from the Tuilieries Palace, notably: the terminals, friezes, door mouldings, fluted pilasters, and cabled columns by Le Vau etc. The dormers and the north pediment were copied from elements on Pierre Lescot’s Petite Galerie in the Louvre. A terrace was built around the edifice with a ironwork parapet taken from the Château de Saint-Cloud, itself destroyed during the Prussian bombardment in 1870. With peculiar irony, the Château de la Punta was again attacked by fire several times, but it was not until 1978 that a serious blaze caused real damage, destroying notably the entire roof. Since that date the château has been uninhabited and closed to visits – not even the exterior can be viewed. Today the slate roof with its lead and copper ornamentation has been rebuilt, but the decoration on the façade appears to need attention. The Conseil Général of Southern Corsica has performed a preliminary study for the restoration of the building and wishes that the monument, built here (according the text on the marble plaque in the pediment) “so as to preserve for the heritage of Corsica a part of French history”, should one day be once again open to the public. From this magnificent route which looks out over all the surroundings of Ajaccio – from the Gulf of Sagone to the Capo Rosse, from the Valley of the Liamone to Monte d’Oro – go back down to Ajaccio and take the direction ‘Porticcio’ as far as the airport. Then turn in front of the camp site CCAS to get to the Genoese tower known as the Capitello. Built in the 16th century at the end of the immense Porticcio beach, the Capitello tower stands at the mouth of the river Prunelli facing the Gulf of Ajaccio. It served as a place of refuge for Bonaparte when he was pursued by Paolist troops in 1793 and was also the rallying point for the family when they fled Corsica after the house in Rue Saint-Charles had been sacked. From here, they set sail for Calvi in Salicetti merchant boats before leaving for Toulon. Legend has it that the tower was breached after an attempt by Bonaparte to mine it. A building at the end of the town bears a plaque commemorating the Bonelli family: “This house was built as the result of a wish expressed in 1796 by General Bonaparte to his comrades in arms of the Italian Army, François and Ange-Toussaint Bonelli, sons of Ange Matthieu Bonelli known as Zampagliono, hero of Corsican independence. During the Italian campaign, Napoleon sent the Bonelli brothers to Corsica on a mission to rid the island of the English. On 5 October 1796, Commandant François Bonelli took possession of the citadel in Ajaccio in the name of the French Republic”. Begun in 1797 but not finished until 1859,’U Palazzu di Napulio’ was never seen by Napoleon. As for Ange-Toussaint Bonelli, he became colonel in the Neapolitan gendarmerie in 1813 and then retired to Bocognano where he became mayor. This third route takes as its subject the urban fabric as created under the First Empire, concentrating on the monuments erected in Napoleon’s honour after his death. We begin in Place du Général Foch in front of the Fontaine des Quatre Lions. This fountain in Corsican granite was built in 1827 following designs by Maglioli. The marble statue – of Bonaparte as First Consul and wearing a Roman toga – is the work of Maximilien Laboureur. The small size of the Place (unchanged from when it was first built), the perfect of integration of the monument in the space, and the statue marvellously set against both the sky and the white and ochre façades of the surrounding buildings lend to the site an unparalleled charm. Take the Avenue du Premier Consul as far as Place Général de Gaulle, previously Place du Diamant. The Place was inaugurated in 1802 by the prefect Miot under the name of Place Bonaparte, and its provides a good example of the developments in urbanism at the end of the 18th century. At that period, towns were planned according to rational principles, following the plans of the cities of antiquity: in other words, with broad arterial roads, roads cutting at right-angles, an exceedingly open, square Place designed to accomodate celebrations and fêtes, symmetrical etc. With this in mind, in Year IX (1801-1802), Miot commissioned from the Maltese engineer Petrucci a grand plan for Ajaccio, comprising the destruction of both the ramparts around Place de l’Olmo (Place Foch) and of the city gate, elements which were an obstruction to the town’s expansion. Miot’s envisaged the new town spreading onto the private gardens on the other side of present-day Avenue Fesch. This plan was replaced by another which, legend has it, was produced under the direction of Napoleon himself. Two copies of the plan survive, and on the back of one of them there is the note ‘plan for the enlargement and decoration of Ajaccio’, sent from Paris via Cardinal Fesch with the added remark “the previous plans approved and partially executed”. It is true that the walls were demolished, as was the Bastion du Diamant, but the new idea sketched two main axial roads for the town and created Place Bonaparte. This plan was thus the beginning of the Cours Napoleon (created from the flattening of a hill, as the still-visible cliffs behind the post office testify) and of the Cours Grandval. The excavated material was to be used to create a new space on the sea front, below Rue Fesch, making space for the construction of the Pughjolu quarter. Most of the this construction work was not completed until much later in the 19th century. Place de Gaulle is a fine urban space measuring two hectares offering a magnificent view of the Gulf of Ajaccio. During the Second Empire a grandiose monument was erected here to the glory of Napoleon and his brothers. The ensemble comprises a statue of Napoleon in Roman costume on horse-back surrounded by standing statues of Joseph, Lucien, Louis and Jérôme, all set on pink granite pedestals. The monument as a whole was designed by Viollet-le-Duc but the individual bronze statues are the work of Barye, Petit, Tholas and Maillet. A commemorative plaque bears the following inscription (here translated): ‘To Napoleon I and his brothers. Corsica remembers you with gratitude. During the reign of Napoleon III, this monument was erected by Napoléon-Jérôme with the assistance of voluntary subscriptions,and it was unveiled on 15 May 1865’. On that occasion, the Prince Napoleon delivered a stinging speech criticising the Emperor’s policies. In the ensuing scandal the Prince Napoléon was forced to resign from his post as Vice-President of the Privy Council as well as from presidency of the commission responsible for organising the Universal Exhibition of 1867. Take the Cours Grandval, which as we have seen was begun in 1801. This main artery for Ajaccio was lengthened in 1862 and named Cours Joseph Grandval after the Marseilles industrialist of Corsican origin of that name. Continue into and along the Cours Général Leclerc until you reach Place d’Austerlitz, traditionally called the Place du Casone from the Jesuit building which once stood there. A monumental ensemble to the glory of Napoleon I was built there and inaugurated on 15 August 1938. The work takes the form of a large promontory made from an inclined stone plane covered with inscriptions, at the summit of which there is a small stepped pyramid which acts as a pedestal for a replica in bronze of the statue of Napoleon by Seurre which once stood on the top of the Vendome column and which today is in the Invalides. The whole ensemble is framed by two eagles bearing the dates of the birth and death of Napoleon. As an architectural metaphor of the Triumph in the ancient sense of the word, this monument is the perfect expression of an ancient Roman apotheosis. The inscriptions merely serve to underline this almost deification of the person: “Napoleon I Emperor of the French 1804-1815. We have seen you rise to the empyrion”. There then follow the names of most of the victorious battles of the epic, from Montenotte to Ligny under Fleurus. Napoleon’s civil works are evoked by the words “Code civil, University, Bank of France, Légion d’Honneur, Cour des Comptes”. Below this monument of doubtful symbolic and a esthetic value lies the ‘Grotte de Napoleon’. A few large rocks in the midst of some olive trees form the cave where, legend has it, the young Napoleon would go to hide. It would take too long to number the authors who have imagined the dreams of that small boy during his solitary retreats, dreams of conquest, glory and empire. That being said, many of these authors have noted the young lad’s passion for ancient Rome. The story goes that during the games organised by the Abbot Recco, the religious in charge of educating the brothers Bonaparte, Napoleon refused point blank to be the Carthaginians because only the Romans could win. Even at this early age he showed a strong desire to be a soldier, as shown by some anecdotes reported by Joseph and Madame Mère. Napoleon was difficult and aggressive as a small boy and lorded it over his elder brother, Joseph, to such an extent that much later on the Emperor was laughingly to say to his son, the King of Rome, then aged two: “What a lazy boy you are! At your age I had already got one up on Joseph’. Return via the same route as far as the Cours Napoléon. Follow this road to number 12 and then take a rest at the Grand Café Napoléon. Although we do not usually mention such monuments, this café is worth a visit. Its vast interior is decorated with dozens of fine engravings relating the principal events of the Consulate and the Empire. On its own, the café is an excellent overview of the Napoleonic period. Carry on to Place Abbatucci and the statue dedicated to the general of the same name. Jean-Charles Abbatucci was born in Zicavo in 1770. Promoted to general in 1795, he was killed in 1796 at Huningue in Alsace. This bronze statue by Vital-Dubraywas erected in 1854. This second route takes us to meet the Bonaparte family. It begins in Rue Saint-Charles in front of the family house. There is documentary evidence for the presence of the Bonaparte family in Corsica as far back as the end of the 15th century. The first member of the family to come to Corsica from Italy, Francesco, had the surname ‘Maure de Sarzane’, from the name of the small Ligurian town from which his family originated. That family is known as far back as the 12th century, and most of the family members were notaries. The Bonapartes’ first house in Ajaccio was at the end of the Grande-Rue. It was demolished in the middle of the 16th century to make room for the citadel. From that period to the 17th century, it is not known where the Bonapartes lived. But in 1682 Giuseppe Bonaparte moved into the house that was to become ‘Casa Bonaparte’. As was the custom in Corsica, the house was divided up between different owners, each possessing one or more rooms, sometimes even a whole floor. By his marriage to Maria Bozzi, Giuseppe took possession of the rooms which had belonged to his wife, and then via careful marriages and simple purchases Giueseppe managed to turn ‘Casa Bozzi’ into ‘Casa Bonaparte’. And it was to this house that Carlo-Maria Buonaparte (the ‘u’ was added to the surname Bonaparte after the attestation of common origin with the Buonaparte family of Florence) brought his young bride Letizia Ramolino on their marriage in 1764. Charles de Buonaparte (such was the name he gave himself on rallying to the French cause) was a lawyer to the Conseil superieur and an assessor of royal jurisdiction in Ajaccio. He was elected to as Deputy to the Corsican nobility in 1772 and even travelled to Versailles in this capacity. Anxious to live as be befitted his rank, he set about enlarging and decorating the family house. This work was continued in 1790 by the Archdeacon Lucien, his uncle, who looked after the family on the death of Charles in 1785. The house was to suffer badly when the Bonaparte family openly showed their support for Republican ideas. In May 1793, when Letizia and her children fled to France, the house was totally sacked and partially burned by supporters of Paoli backed by the English. It was subsequently requisitioned by the English as officers’ lodgings and the story goes that Hudson Lowe, Napoleon’s future jailer on St Helena, lived there on the first floor. In October 1796, when the English were driven out of Corsica, the Bonaparte family returned to their house and began significant building work paid for by compensation from the Directory. The complete restoration of the house was finished in 1799 and the new furniture – still there today – was bought in Genoa and Marseilles. Napoleon, the second son of Charles and Letizia, was born in this house on 15 August 1769. The future Emperor was given the strange name Napoleon – a name which he himself considered ‘virile, poetic and a little excessive’ – in memory of the Napoleon’s uncle, the brother of the Archdeacon Lucien, who died in Corte a few weeks before the battle of Ponte Nuovo. All the other children of the Bonaparte couple were also born in this horse, the only exception being Joseph whom we shall meet in our discussion of the house in Corte in which he was born. Stendhal in his Vie de Napoléon gave a very symbolic version of the Emperor’s birth: ‘On 15 August 1769, the day of the Feast of the Assumption, Madame Bonaparte was at Mass when she felt birth pangs so sharp that she had to return home with all haste. She did not reach her chamber in time and her child came into the world in the antichamber onto an antique carpet decorated with large figures of heroes’. When Letizia later heard of this story, she remarked ‘He made it up. Was that really necessary?’ adding ‘We never had carpets in our houses in Corsica. And if there was a reason to have them in winter, there was certainly none for having them in Summer’. But it is true that Letizia was too late to get to her bedroom and so gave birth on a sofa – the Louis XVI chaise-longue, however, with its reversed back, on show in the house very definitely postdates this birth. Apparently of a weak constitution, the baby was summarily baptised at home on the authorisation of the Archdeacon Lucien. He was breast-fed not only by his mother but also by a wet nurse called Camilla Ilari, a tough peasant girl and daughter of an Ajaccio sailor, and she was to be remembered by the future emperor for the rest of his life, to the extent that she was remembered in his will. When the family left Corsica for good in 1799, the house was left to her good offices and Napoleon even thought at one point of giving it to her. In the end, Casa Bonaparte was given to one of Letizia’s cousins, André Ramolino, and he in return agreed to hand over his own house to Camilla. In this narrow street, Maison Bonaparte, (which after suffering many different fates became a National Monument in 1967) with its tall and sober façade stretching over three stories is characteristic of 18th century housing in Ajaccio. The museum is divided into two parts. The second storey recounts the history of Corsica in the 18th century and that of the Bonaparte family, whilst the first floor contains the historical apartments. On leaving the museum, visitors should stop for a few moments to take a pleasant rest in the small garden opposite the house and admire the bust of the King of Rome placed there in 1936 on the centenary of the death of Letizia. At the end of Rue Saint-Charles, in Rue Forcioli-Conti (in the neighbourhood in which Napoleon grew up) stands Ajaccio Cathedral. Built on a modest scale, this edifice which dates from the end of the 16th century is a place of Napoleonic pilgrimage. True to the story as Stendhal told it, Letizia did indeed feel the first birth pangs there – some even went so far as to say that she gave birth on the cathedral steps. Napoleon was baptised in the cathedral by his great-uncle the Archdeacon Lucien (assisted by the treasurer Gio Balta Diamante) on 21 July 1771 at the same time as his new born sister Maria Anna, who died before the year was out. The birth certificate – a copy of which can be seen in the Salon napoléonien in the Hôtel de Ville – was written in Italian and neither the town nor the church in which the ceremony took place is mentioned. It is certified by François Cuneo, advisor to the king and royal judge for the province of Ajaccio. Napoleon’s godfather was Laurent Giubeca, the royal procurer, and his godmother was his aunt, Gertruda Paravicini. The baptistry where the ceremony was held can still be seen today in the entrance to the catheral. In 1869, the Empress Eugénie and the Prince imperial, visiting Ajaccio on the hundredth anniversary of the Napoleon I’s birth, were present at the singing of a Te Deum here. They also took part in the laying of the foundation stone for a new cathedral which was never to be built. Go back onto Rue Saint-Charles and walk as far as Rue Bonaparte. This main arterial road, the “Carrughiu drittu” (the straight road) was one of Ajaccio’s first roads and during the Genoese period it was lined by the houses of the wealthy. Most of these houses were rebuilt in the 19th century. On the right, at number 17, is the house which once belonged to the Pozzo di Borgo family, into which was born Charles-André (1764-1842), distant cousin and close friend of Joseph and Napoleon, who became their sworn enemy during the Paulist struggle. Because of his opposition to the republican government in 1796, Charles-André was forced into exile in England and later to Vienna. A wily diplomat and a confirmed opponent of the Emperor, Pozzo di Borgo subsequently joined the staff of Russian Tzar. Since his property was not included in the general amnesty law of 1796, it was confiscated. Hôtel Borgo di Pozzo was refitted between 1820 and 1825, and although today the building is in disrepair, it has fine trompe’d’oeil decoration on the façade and a richly sculpted door framed by Ionic columns. Further on down the road there are two plaques, at number 5 and number 10 respectively, commemorating the two famous men who once lived there. The ‘Father of the Homeland’, Paoli, lived in what was once the “Publico palazzu” or town hall in 1791 and Murat lived in the Hôtel de la Croix de Malte in September 1815 before embarking on his ill-fated attempt to reconquer the Neapolitan throne which came to a tragic end at Pizzo in Calabria. Rue Bonaparte enters Place du Maréchal Foch where in addition to the statue of Bonaparte and the Lions (to be dealt with in the following route) there is the Hôtel de Ville or town hall, also called by the locals the “Maison Carée”. This Neoclassical edifice, built in the first quarter of the 19th century and whose austere façade is slightly softened by the beautiful red ochre of the plaster work, contains a Salon napoléonien. Two rooms on the upper floor are arranged so as to provide exhibition space for the collections which have been left to the town. A good number of members of the imperial family are represented in painting and sculpture, of which the most remarkable are some by Girodet and Canova, not to mention copies of Gérard and Winterhalter. An interesting collection of coins and medals depicts the major events of the Napoleonic epic, both of the consulate and the Empire. The sole contemporary work in this Salon is the allegorical ceiling fresco painted by the Corsican artist Dominique Frassati – it shows Napoleon I surrounded by figures from the imperial court, soldiers of the Grande Armée, and symbolic figures. Whilst the artist is clearly talented, the work is remarkable for its confused composition and poor quality. Indeed it is clear proof of how difficult it is to master the Grand Manner, or the History painting, a style almost completely abandoned by the 20th century. But given that 20th century representations of Napoleon are rare, this makes interesting viewing. On leaving the Hôtel de Ville, go right onto Rue Fesch. This quarter, known as “U Borgu” (the borgo), was inhabited by the Corsicans who could find no room in the Genoese city. And the name of this extra-muros city has remained attached to Rue du Cardinal Fesch. At number 28 a plaque commemorates an event from Napoleon’s youth. The text (translated) runs as follows: ‘For three days in May 1793, Napoleon Bonaparte stayed in this house belonging to ex-mayor Jean-Jérôme Lévie. Napoleon was being pursued by anglo-paolists and Lévie welcomed him into his house where he had assembled a armed posse of men from the hills. When the gendarmes came to arrest them, Lévie managed to get his men away without a fight, and on the same night he arranged for Napoleon to escape by sea to Calvi and then to the Provençale coast. Seven months later (21 December) Bonaparte took Toulon’. As First Consul, Napoleon named Lévie as Mayor of Ajaccio in 1800, but Lévie refused the post because of his age. Further down the street, at number 50, one palace is particularly notable for the austere lines of its Classical architecture. Palais Fesch was built on the orders of Cardinal Fesch, Napoleon’s maternal uncle, born in Ajaccio in 1763 and who died in Rome in 1839. Ordained priest in 1785 and made Archdeacon of Ajaccio in 1787, Fesch was subsequently nominated vicar to the Bishop of the town. He fled Corsica with the rest of the Bonaparte family in 1793, following his nephew to Italy, and for a brief time forgetting his ecclesiastical duties he acted as a supplier to the armies. Made Archbishop of Lyons in 1802, Cardinal in 1803, Grand Chaplain to the Emperor in 1805, disgraced in 1812 after his siding with the Pope, Fesch took refuge in Rome in 1814, and he was to spend the rest of his life there building up his prestigious collection of Italian paintings. “Do not get me second-rate pictures” he wrote to his buyer in Rome; “If it is not fine and beautiful, I do not want it”. In his will dated 1839 he expressed his wish “to found a great establishment dedicated to God in his three persons” where deserving and studious young men could study the sciences and the arts. Furthermore, he bequeathed to the town of Ajaccio a small part of his collection of paintings, “some original works of all the schools, in the attempt to found a museum which would help in the instruction of young people”. The building was finished in 1840 and commandeered as a barracks. In 1847, the edifice finally opened its doors as an Institut d’études, and in 1852 as a Museum, but over time the museum galleries were gradually replaced by classrooms. Palais Fesch remained a boys school until 1936, before becoming a soup kitchen during the Second World War. At the end of the 80s, the building once more became a museum and today it houses one of the largest provincial collection of Italian painting in the world. In addition to the painting collection the museum also has a significant Napoleonic section containing some remarkable works. Palais Fesch dominates the port and the city. In front there stands a large courtyard with an imposing statue of the Cardinal set in the centre carved by Vital Dubray – bas-reliefs on the pedestal recount the most important events in the Cardinal’s life. Commissioned and installed during the Second Empire, this statue is part of Napoleon III’s work in Ajaccio. In fact Napoleon III had declared ‘Corsica for me is not just another ‘departement’, it is a family’, and he tried throughout his reign to bring about an economic upturn on the island. He took similar pains with the heritage left by his illustrious ancestor and was careful to preserve his family memory. Hence the right wing of Palais Fesch was commissioned to house the Bonaparte family chapel. The Imperial chapel was built under orders from Napoleon III, between 1857 and 1860, in response to Cardinal Fesch’s wish, expressed in his will, that he should be buried in a church built for him and his family in Ajaccio. The latter became the family burial chapel of the Bonapartes. The bodies of Charles and Letizia, Napoleon’s parents, Joseph Fesch, Charles-Lucien Bonaparte, Prince of Canino and of Misignano, the latter’s children Napoléon-Charles, Zénaide and Eugénie, Prince Victor and his wife Clémentine, and Prince Napoleon all lie in the crypt. Every year Masses are celebrated there on the anniversaries of Napoleon’s birth and death. Going a little further down Rue Fesch, at number 44 (close to the house in which Tino Rossi, the man christened ‘the Napoleon of Romance’, was born) there is a plaque commemorating Bonaparte’s opposition to Paoli. It was here in January 1791 that Napoleon read out his first public speech, a letter to a Royal sympathiser Matteo Buttafuoco, during a meeting of a patriotic club associated with the Jacobins. The first route is a historical walk which takes us back to the origins of the town. The starting point is in front of the citadel watchtower. Ajaccio works its magic on the visitor through its magnificent gulf, often compared with the bay of Naples. One can easily imagine that it was these harmonious curves which encouraged the first ancient inhabitants to settle here. In fact, in the Saint-Jean quarter, to the East of the modern-day town, there are remains dating from the third century AD which suggest Roman occupation, and the remains of a Paleochristian basilica have been also uncovered there. Moreover, the Bishop of Ajaccio is mentioned in the letters of Gregory the Great around the year 600. The establishment of a Genoese colony in the 12th century brought properity to the town. The aim of the Genoese was to set up a new port providing protection on the sea route between Calvi and Bonifacio. Hence they chose Ajaccio as the site for a small strong hold, Castel Lombardo, of which nothing today remains. Because the site proved malarial, it was abandoned during the 15th century and, in 1492, the rocky promontary of Capo di Bollo on the tip of the Leccia was chosen as the site for a new town. About a hundred Genoese and Ligurian families, the Bonapartes among them, were sent there to colonise it. The broad outline of the plan of this old town can still be seen around the citadel. It was arranged around three roads spread out like a fan: the strada del Domo (rue Forcioli-Conti), the strada San Carlo (rue du roi de Rome) and the strada dritta (rue Bonaparte) on which stood the town gate. The Citadel was built when the town was founded in 1492. At the time, ther citadel itself was merely a castello, in other words a keep and a lower precinct. 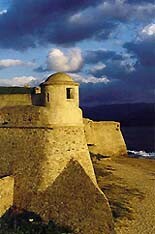 In 1502, strong defensive walls were built around Ajaccio. The citadel was modified and extended during the occupation of the French between 1553 and 1559. In the latter year, in accordance with the Treaty of Cateau-Cambrésis, Corsica was returned to Genoa. The engineer Jacopo Frattini was sent to Ajaccio to fortify the citadel: he erected a solid bastion on the seaward side and dug a wide moat separating the citadel from the town on the landward side. It was not until the first quarter of the 18th century that the island tried to free itself from the yoke of its occupants. The nationalists tried four times to seize Ajaccio, namely in 1729, 1739 and 1763, but without success, and the town which one traveller of the time called the “prettiest little town in the Mediterranean” passed directly under French jurisdiction when Corsica was ceded by Genoa in 1768. And as the fortified part of Ajaccio, the citadel must have played a major role in these events. It certainly was an object of fascination for the young Napoleon. Many historians have recounted how Napoleon used to go to watch the changing of the guard there. And even though this has never been verified, it is not entirely surprising given that the Bonaparte family house was not far away. On the other had, much more than conjecture were Napoleon’s repeated attempts in 1792 and 1793 to seize the castle. Having chosen to side with France and having been nominated Lieutenant-Colonel in the Corsican National Guard, he fought Paoli’s forces several times, but never managed to take the citadel. It was on the final failed attempt in June 1793 that Napoleon and his family was forced into exile. Today it is unfortunately not possible to visit the citadel since it is occupied by the armed forces, but by taking a walk down the Boulevard Danielle Casanova and the Quai Napoléon the plan of the whole can be imagined. Before leaving Boulevard Danielle Casanova, visitors should take time to view number 18. There in a building dating from the Genoese period stands a small charming private museum, the Musée du Capitellu. Here the entire history of Ajaccio (from the foundation to the present day) is retold through the memorabilia of one family. On show are items of porcelain, silverware, furniture, and crockery alongside paintings by Corsican artists of the 19th and 20th centuries. But the ‘jewels’ of the collection are undoubtedly some Italian works dating from the 16th century. Contrary to the famous phrase which defined Ajaccio as ‘one large Napoleonic monument with a few houses around it’, there are only a few items relating to Ajaccio most famous son. Indeed whilst a small bust of Napoleon greets visitors as they enter, it is Elisa Bacciochi’s husband Felix (b. Ajaccio 1762) who is the subject of many of the later exhibits. In the few exhibition cases containing Napoleonic material there are: an ensemble of figurines representing Napoleon’s squadron of the 13th Hussars, conscripted in 1813; and a gilded silver campaign service by Biennais offered by the Emperor. In addition to this town house, the Bacciochi family also had a family palace situated on Rue Ange Moretti outside the centre of town, Villa Bacciochi, which is today the private school ‘Saint Paul’. The chief attraction of the Musée du Capitellu, however, lies not so much in the exhibits as in the welcome given to the visitor by the museum curator Mr Ottavi-Sampolo. It would appear that there is nothing that he does not know about the history of the town, and he recounts it with enthusiasm and charm. From Boulevard Danielle Casanova, take the Rue du Roi de Rome, one of the oldest in the city, as far as Avenue Macchini, then at the very start of the Cours Napoléon, turn left into Rue du Général Lévie where stands the Musée A Bandera, immediately identifiable by the fresco on the façade depicting the great figures of Corsican history, Sampiero Corso, Pascal Paoli and Napoleon Bonaparte. The Musée d’Histoire Corse Méditerranée A Bandera is designed as a museum for the general public, and for the visitor is a useful introduction to the island. In an arrangement which is very informative and easy to use – but on the other hand less defensible in museological terms – the exhibition covers ten centuries of history. Describing itself as monument to Corsican history, the museum traces the key episodes in the island’s history from Pre-history and the famous standing stones right up to the Second World War, during which the island was the first French department to be liberated. Of particular interest to the Napoleonic visitor are rooms three and four, since they deal respectively with: the stages of national uprising which led to Corsican independence; the ‘Father of the Homeland’ Pascal Paoli; the French conquest; and to a lesser extent the First and Second Empires. The exhibits take the form of arms, costumes, coins, short plays, figurines and dioramas, and everything is accompanied with very detailed descriptions. Hence Napoleon’s Corsican policy, a subject which it would be difficult to present with artefacts, is dealt with in detail by the text, which gives details of: the reconquest of the island in 1796 from Italy; the fight against the various insurrections; the division of Corsica into two departments, Liamone and Golo; the subsequent reunion in 1811 of the two departments with Ajaccio as the principal town; the lowering of charges and the removal of customs duties on imported goods. The ‘dark side’ of this policy was embodied by the appointment of General Morand, the governor who ran the island with what was in effect a military dictatorship. And it was the excesses of this ‘Giustizia Morandina’ which most of all led to the tarnishing of the Emperor’s reputation in his native land. Indeed, Napoleon himself recognised that he had not done enough for his people: “I was ungenerous to the Corsicans; I was wrong, I should have done more. It is true that my name alone has brought them something and that they think that I did a great deal. In fact, all the ministers and marshals were open to me helping them. I reacted against that, but unbeknownst to myself, many found positions’ (Cahiers de Sainte-Hélène, May 1816). One picture is particularly interesting in this respect – it gives a list of the Corsicans who served the Empire. Bastia takes its name from the Corsican words for ‘the fortress’ (a bastia), the building towering over the sea which was built on the promontory at Cardo by the Genoese governor, Leonello Lomellini. In the second half of the 15th century, a new quarter sprang up around the primitive fort. It took the name of Terra Nova to mark it out from the older quarter called Terra Vecchia which bordered the port itself. Whilst Terra Nova became home to the Genoan governors of the island, Terra Vecchia remained the fief of the Corsicans who had come to Bastia attracted by the prosperity of the town. Over the period from the 16th century to the 18th century, the town increased in economic, political and cultural strength, to become the political centre of Corsica during the period of French occupation between 1796 and 1811. Bastia briefly lost her pre-eminence in favour of Ajaccio after the period but recovered it to keep it throughout the whole of the 19th century. Visitors to Bastia often begin their exploration with the Terra Vecchia and the Place Saint-Nicolas. The Place itself is the result of 19th-century urban development, formed as it was from the earth excavated during the cutting of a railway tunnel. It was the site of public executions up to the 20th century. Agostino Giafferi, the head of the Crucetta Revolt – fiercely put down by Lucien Bonaparte and General Casalta – was shot here on 21 February 1798. During the Second Empire, a marble statue of Napoleon in Roman costume (carved by the Florentine sculptor Bartolini in 1853) was erected here. Place Saint-Nicolas is today a place where the inhabitants of Bastia come to stroll and chat. Continuing your visit to Bastia towards the Terra Nova, you come to the old port which was the scene of an important episode in Napoleon’s childhood. It was here on 17 December 1778 that Charles Bonaparte, his two sons Joseph and Napoleon, together with the boys’ uncle Joseph Fesch, set sail for France. Fesch was heading for the Seminary in Aix and the young Bonapartes were destined for the Collège d’Autun. Napoleon was to stay at the Collège for only three months before entering the Brienne military school. This was his first exile from his native soil and it was to last eight long years. However, throught his entire school life, Napoleon was to display excessive love for his island of origin as well as a fierce patriotism which was frequently noticed by his teachers and fellow pupils. In Terra Nova, the Governor’s Palace is worth a careful visit. It was in the prisons of this palace that high-ranking Roman clergymen were imprisoned in 1811 when they were deported to Corsica on orders from Napoleon. Today the building houses a museum of Corsican ethnography which presents the history, geology and archeology of the island. This museum has in addition a small collection of Revolutionary and First- and Second-Empire items, notably: bonbonnieres, boxes, fans, miniatures, albums of engravings, packs of cards from the Revolutionary period, porcelain, faience and furniture. Indeed it is a fine ensemble containing some exceptional exhibits: a small Apollo by Canova, the Empress Josephine’s crystal service from Malmaison, a sculpted fragment from the Vendome column showing the head of a grognard, the death mask of the emperor offered to the town in 1834 by Madame Mère following a request by the inhabitants in favour of abrogating the law of exile of the Imperial family, etc. The museum is at present closed for reconstruction work, but is expected to reopen soon (for information call 04 95 31 09 12). A specialist library is open to researchers. The museum is also home to the Société des Sciences historiques et naturelles de la Corse, a society which has been publishing a bulletin since 1881. On leaving Bastia, take the D80 in the direction of Cap Corse. The Cap Corse peninsula forms the northern most tip of the island and is 37 km long and 14 wide. The villages are all placed high up and linked to their ports by torrents. The largest of these ports is Macinaggio, in the commune of Rogliano, and several actors from the Napoleonic epic passed through here. A commemorative plaque set up in 1937 on the Post Office records these appearances: ‘Historical events. On 13 July 1790 Pascal Paoli on returning from exile disembarked here and cried “O my homeland! When I left, you were in slavery, and I have returned and you are free”. On 10 May 1793 Napoleon Bonaparte, coming from Ajaccio, disembarked in Macinaggio, then headed for Bastia and subsequently Toulon to fulfil his glorious destiny. He was never to see his island again’. The plaque omits to mention another member of the imperial family who took refuge here in Macinaggio. On returning from the inauguration of the Suez Canal in 1869, the Empress Eugénie took shelter here in the small port. Calvi, the capital of Balagne, was founded by the lords of the island in the middle of the 13th century. When the city was handed over to Genoa in 1280, Calvi possessed a fort, and over the years this was transformed into a citadel which these days is classed as a historical monument. Major construction work undertaken during the 15th and 16th centuries gave the place the look it has today. Indeed the town’s motto is still a declaration of loyalty to Genoa. As a fort of strategic importance, it was attacked by Paoli and his troops in 1755 and 1768 but it was not taken. Unable to take control of the castle and its port, Paoli decided to solve his problem by founding another port about thirty kilometres down the coast, the Ile Rousse. During the siege of 1794 and the revolution, Calvi was the scene of heroic resistance. The French troops had been cooped up in the fort and under a siege, conducted by Paoli’s English allies, for forty days. General Stuart, the commander of the besiegers, arranged his men on the hills around the city and pounded it with shell fire. With the city reduced to rubble by a hail of bullets and cannonballs, the French surrendered and were allowed by the English to retire with all honours on 10 August 1794. The siege of Calvi was a moment of success for one of the most significant figures in Napoleon’s future career, the victor at the Battle of the Nile and Trafalgar, Horatio Nelson. Nelson was in command of one of the vessels during an assault on the city and it was then that he lost one of his eyes. In addition to this famous incident, the citadel was also witness to another event in the Napoleonic epic. On 11 June 1793, the Bonaparte family in flight from Ajaccio boarded ships in Calvi enroute for Toulon. A plaque on the wall of the ex-gendarmerie commemorates the event: “In this house Napoleon Bonaparte with his family was welcomed by his god-father Laurent Giubega as he fled Ajaccio, May-June 1793”. By taking the coastal train which goes from Calvi to Ile Rousse, it is possible to get off at Algajola. About 500 metres down the Aregno beach, there is an abandoned quarry for pink and yellow granite porphyry. It was this quarry which in 1810 was used for the pedestal of the Vendome column, and in it there is a remarkable monument, namely, the column (left unfinished) commissioned during the first half of the 19th century by the town of Ajaccio in honour of its most famous son, Napoleon I. The column measures 17 metres in length and 2.74 metres in diameter, has 32 facets and weighs 272 tonnes. It was carved by Italian craftsmen in 1836 but never transported to Ajaccio. Ever since, this column which was to have carried a replica of the statue by Seurre has lain abandoned in this deserted spot. Famed for its remarkable site at the top of a chalk cliff, Bonifacio seems at first to be a peninsula. Indeed, the strategic importance of this place overlooking the strait between Corsica and Sardinia made the building of a citadel imperative. No-one knows the origin of the town, but the existing settlement was conquered by the Genoese at the end of the 12th century. The first castrum, of which several traces can still be seen, dates from this period. Using the natural features, the town was gradually encircled by ramparts and strong bastions. In one of these bastions, the Bastion de l’Etendard (a tower converted in the 16th century to house artillery), there is a small museum in which there are reconstructions representing the prehistoric past and also the history of the site. Wax figures appear in scenes such as: ‘The woman of Bonifacio’, ‘The Genoese Guards’, ‘Charles V’, ‘Bonaparte in Bonifacio’, etc. According to tradition, in 1793 the young lieutenant colonel Bonaparte lived in the Rue des Deux Empereurs in the old town. In 1541, on his return from Algiers, the Emperor Charles V had stayed at number 4, and a commemorative plaque records that the future emperor Bonaparte was to live in the same house during the period February-March 1793 during the preparations for the Maddalena expedition. On his return from the failed expedition, Bonaparte surrounded by some sailors narrowly escaped assassination. During the Second Empire, Bonifacio suffered a terrible tragedy. On 14 February 1855, La Sémillante, one of the last wooden sailing boats to be built in France, left Toulon for Constantinople with 301 sailors and 392 soldiers on board (reinforcements for the French troops fighting the Crimea). In the night of 15 February, a violent storm drove the frigate onto the rocks off Bonifacio. There were no survivors. Two new cemeteries had to be created on the Ile Lavezzi. Soveria was the birth place of Jean-Baptiste Cervoni, the Division General killed in 1809 at Eckmühl. The thread linking all these men from Corsica is their extreme loyalty to the Emperor: indeed most of them followed him into exile and to his death, and Napoleon remembered many of them personally. Twenty-one Corsicans figured in his will, amongst whom were dear remembrances from his childhood (his nurse Camilla Illari, the Abbot Recco, Nunzio Cosat, Jérôme Levie and the friends and partisans of Bocognano). This desire to remember the faithful companions of his childhood and youth show the Emperor’s noble attachment to, and sincere gratitude towards, his compatriots. Corsica’s cultural heritage is extraordinarily rich. It would be is impossible to recount here the multitude of treasures potentially of interest to the curious visitor – archeology, pre-history, proto-history, Greco-Roman history, Mediaeval art, the Corsican school of art, sacred Baroque architecture, etc. All we can do here is give a few indications of the recommended visits in Ajaccio and the surrounding area. In one of the Napoleonic routes round Ajaccio, two towers – the Parata and Capitello towers – were mentioned. Others constructions of a similar type can be seen all over Corsica. We give here a short history of these so-called Genoese Towers. Ajaccio is not simply Genoese town, a First Empire town and the cradle of Napoleon Bonaparte. It also developed considerably during the second half of the 19th century and at the beginning of the 20th century as a direct result of increased tourism. Up to the First World War, Corsica had been a tourist destination reserved for the privileged few. The first tourists to follow the travellers of the Romantic period were the English aristocracy. In 1830, the first steam boats to Corsica took only a single night to travel to Ajaccio from Marseilles and Nice. The island then became a holiday resort for the English upper classes who were attracted by the gentle climate and the wild beauty of the countryside. To the west of Ajaccio, the ‘foreigners’ quarter’ ideally situated between the Cours Grandval and the sea was the principal area inhabited by these cosmopolitan visitors. Private villas and luxury hotels attracted the likes of Sissi and Joseph Conrad. By walking up the Cours Grandval towards the Place d’Austerlitz, the visitor can still see buildings dating from this period, both sumptuous villas and converted Grand Hotels. The Grand Hotel Continental, today the main office of the Collectivité territoriale de Corse, is a fine example of this ‘Belle epoque’ phenomenon, and it transports the viewer back to an age of luxury and elegance. The magnificent exotic garden which stands in front of the building was part of the original hotel. A little further up the street, the Château Conti is a grand residence built by a Collector General of Finances of the Second Empire, Etienne Conti. Yet further up, at number 2 Rue du Général Leclerc, a wealthy Scots lady Miss Campbell built an Anglican church in local granite. Destined for English ex-patriots in Corsica, it was consecrated in 1878. By taking Rue Miss Cambell and then Rue Gabriel Péri, you come to the sea front and the casino built in 1934. In the 30s, visitors began to be attracted to Corsica for its thermal spas. After an interuption during the Second World War, tourism began again in the 60s and this island of beauty is today one of European holiday-makers’ preferred destinations. In addition to its architectural jewels, the region of Ajaccio has rich resources of flora and fauna. The outskirts of the city offer the possibility of excellent walks and there both beautiful flowers and interesting wildlife can be seen inabundance. The Office national de forêts also suggests walks of different lengths in the forests of Chiavari and San Antone, both close to Ajaccio (see Practical information). Here below are some easy walks which visitors may take (be sure to take some water, something to protect you from the sun and good shoes!). Le sentier des Crêtes (The walk along the cols)(1h30) – a walk along the side of the hill from the Bois des Anglais to Vignola. Finishing at a height of 370 feet, the walker ends up with an excellent view of the Gulf of Ajaccio. Those too tired to walk back can take the number 5 bus. La corniche du Couchant (The western cliff walk)(1h30) – a walk which starts about a kilometre from the Parata Tower. The clifftop path (fifty metres above the sea) leads to the beaches of the Capo di Feno. There are many points where the walker gets spectacular view of the Iles Sanguinaires. The return can either be by the same route or by a route which starts from the beach and joins the Route des Sanguinaires. La Rocher de Gozzi (The Gozzi cliff) (3h) – this walk is accessible via the D81, direction Calvi and Cargèse. Turn right at the Route d’Appietto and stop at the San Chirgu Chapel. The path begins again behind the church and leads to an eagle’s nest where the Counts of Cinarca once built a fort, traces of which can still be seen. La tour de Capo di Muro (The Capo di Muro Tower)(1h30) – this walk is marked on the D155 after the hamlet Acqua Doria. Walk on the right until the beginning of the path which turns off into the undergrowth in the direction of the Capo di Muro tower. From that tower the viewer can see 7 of the 90 watch towers built all around the Corsican coast. The towers which are incorrectly known as Genoese towers – incorrectly in the sense that not all of them are in fact Genoese – are a typical feature of the Corsican coastline. And whilst they lend charm to the sites where they are placed, they are also first-hand witnesses to Corsican history. The construction of coastal watch towers began to be part of Corsican defence policy as early as the end of the 15th century, and it continued up to the 17th century. The Order of St George and subsequently the Republic of Genoa were the originators of this policy, and the Corsicans followed suit. This system of defence was designed to help in the fight against the piracy which at the period was the scourge of the coastal plains. Tower building increased to such an extent through out the 16th century that on 25 June 1593 a standardised plan for them was laid down. Towers could not be built without the governor’s permission, and the cost was shared between all the inhabitants who benefited from the protection which the tower (guarded by two or four torregiani) afforded. Some of the towers are square in plan – such as the Porto tower – but the majority of the 90 towers are circular. In height they vary from 12 to 17 metres and they were built as frequently at sea-level as on the cliffs. In construction they are made up of three clearly defined sections: the base (solid and without windows), the shaft (pierced by doors, bays and loopholes), and the platform (crenelated and sometimes topped by a watchtower). For more details consult: A.M. Graziani, Les Tours littorales, Editions A. Piazzola, 1992 and G. Méria and F. Rombaldi, Les Tours du littoral de la Corse, La Marge, 1990. Paul Bartel, La jeunesse inédite de Napoléon, Amiot-Dumont, Paris, 1954. Arthur Chuquet, La jeunesse de Napoléon, I. Brienne, Armand colin, Paris, 1897. Louis Madelin, Histoire du Consulat et de l’Empire, 1.La jeunesse de Bonaparte, Tallandier, 1974. Nasica, Mémoires sur l’enfance et la jeunesse de Napoléon, 1852. Pierre Antonetti, Trois études sur Paoli, La Marge Editions. Maurice Bartoli, Pasquale Paoli, père de la patrie corse, 1866, Albatros, 1974. Charles Napoléon, Bonaparte et Paoli. Aux origines de la question corse, Perrin, 2000. Moray McLaren, Corsica, Boswell, Paoli, Johnson and Freedom, London: Secker & Warburg, 1966. Paul Arrighi and Antoine Olivesi (eds), Histoire de la Corse, Privat, 1990. Paul Arrighi and Francis Pomponi, Histoire de la Corse, Que Sais-Je?, PUF, 1979. Collectif, Histoire d’Ajaccio, La Marge Editions, 1992. Fernand Ettori (ed. ), Corse, coll. “Encyclopédies régionales”, Editions Christine Bonneton, 1992. Prince Roland Bonaparte, Une excursion en Corse, 1891, rééd. Jeanne Laffitte, 1982. Pascal Marchetti, Une mémoire pour la Corse, Flammarion, 1980. Francis Pomponi (ed. ), Mémorial des Corses, Mémorial des Corses, 1981-1982, 6 volumes. Guide Bleu Corse, Hachette, 1990. Roberto Colonna d’Istria and Francis Rombaldi, Les plus belles balades en Corse, Editions Les Créations du Pélican. Lucette Poncin, Promenades dans Ajaccio, CRDP de Corse, 1995. Georges Ravis-Giordani, Le guide de la Corse, La manufacture, 1991. Anna Maria Salone and Fausto Amalberri, La Corse. Images et cartographie, Editions A. Piazzola, 1992. Le guide corse de la Corse, Editions Les Amis de la Corse, Fiumorbu, 1998. Cartes I.G.N. TOP 25 au 1/25 000e. Alexandre Dumas, Les Frères corses, 1844, La Marge Editions, 1988. Gustave Flaubert, Voyage dans les Pyrénées et en Corse, 1848, Albatros, 1983. Guy de Maupassant, Une page d’histoire inédite, 1880 ; Histoire Corse, 1881; Un bandit corse, 1882; Une Vendetta, 1883; Le Bonheur, 1884, in Contes et Nouvelles I, Bibliothèque de la Pléiade, Gallimard, 1974. Prosper Mérimée, Mateo Falcone, 1829; Colomba, 1841. Paul Morand, Bains de mer, 1960, Arlea 1990. Alexis Ponson du Terrail, Les Bandits, 1852, La Marge Editions, 1992. Mathieu Ceccaldi, Anthologie de la littérature corse, Klincksiek, 1991. Pierrette Joeffroy-Faggianelli, Image de la Corse dans la littérature romantique française, PUF, 1979. Maurice Ricord, Découverte littéraire de la Corse, Nouvelles Editions latines, 1963. Hyacinthe Yvia-Croce, Anthologie des écrivains corses, Cyrnos et Méditerranée, Ajaccio, 1987. The Tourist Office offers visitors excellently produced brochures on the history of the town. Guided tours directed by local guides are also available. The themes are as follows: The saga of the Bonapartes; Ajaccio during Genoese rule; Architectural tour – from medieval to Imperial city. There are two tours: the imperial city (45 mins) and the bloody islands (1h30). There are also other celebrations in Ajaccio every year for the anniversaries of the birth (15 August) and the death (5 May) of Napoleon, as well for the commemoration of the sacre coronation ceremony and the Battle of Autserlitz (2 December). Open every day from 10am to 12pm and from 2 to 6pm, from 15th March to 15th October. 1 July to 15 September: open Monday through Saturday, 10am to 7pm; Sundays 10am to 1pm. 15 September to 30 June: open Monday through Saturday, 10am to 5pm; closed Sundays. Open every day except Mondays, 25 December and 1 January. 1 October to 31 March: 10am to 112pm, 2pm to 4.45pm. 1 April to 30 September: 10.30am to 12..30pm, 1.15pm to 6pm. Closed Monday mornings, Sundays and public holidays. 15 June to 15 September: 9am to 11.45am, 2pm to 5.45pm. 16 September to 14 June: 9am to 11.45am, 2pm to 4.45pm. Open in summer from 9am to 12pm and from 1pm to 4pm; from 9am to 12pm and from 1pm to 5pm in winter. Your complete guide to Corsica online!